Looking for another stellar Weight Watchers Super Bowl Recipe that’ll give your guests the Super Bowl snacks they love, but still keeps you a good Weight Watcher? Well, you’ll be the hit of the party with this crowd pleasing Weight Watchers 7 Layer Mexican Bean Dip Recipe! With just 3 Weight Watchers Points per serving, it’s one of the best Mexican Bean Dip Recipes you’ll find that not only is low in fat and calories, but tastes great and is good for you! Full of fiber and calcium and low in calories, this slimmed down traditional 7 Layer Dip Recipe is incredibly easy to make and is a fabulously healthy party food. So, if you are a Weight Watcher, there’s no need to give up your favorite Super Bowl Recipes this year – just try out my lower Points versions and stay on track to reach your weight loss goals! GO STEELERS!!!! * Top this killer Mexican Bean Dip Recipe with some sliced jalapenos for an added kick! Combine sour cream and taco seasoning; mix well. In a large bowl, combine tomatoes, tomatillos, red onions, cilantro, salt, and pepper. In a separate 12-inch round glass serving bowl, spread bean dip on the bottom. 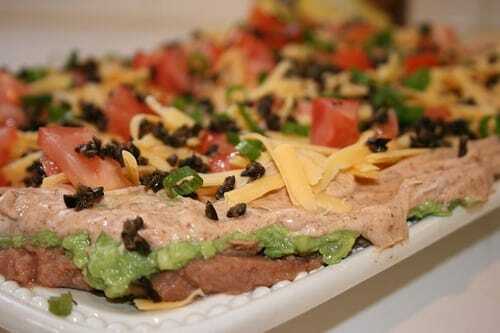 Top with guacamole, sour cream, tomato mixture, cheese, scallions, and olives. Serve with baked, low fat tortilla chips, like these Guiltless Gourmet Yellow Corn Organic Baked Tortilla Chips. *Remember to count the Weight Watchers Points for the chips separately! With any recipe that calls for taco seasoning, I use a bit of El Pato sauce. It’s what I use to make my taco meat. I just found this website and love it!…. Seeing the comment Go Steelers- was a little difficult for a Packer fan. :) This site is great. Thank you for all the hard work in putting it together. I LOVE your site! I was just wondering how many servings in total for the recipe? There's a total of 12 servings in the whole recipe. Hope that helps! And thanks for your kind words! I'm glad you like the site! I do something very similar, but I never thought to add guacamole. What a great idea! I'll have to try that the next time I make it.